While Octopus focuses on continually delivering new versions of an application (the applications you are building yourself), these kinds of tasks are one-off and are usually done by a different set of tools. 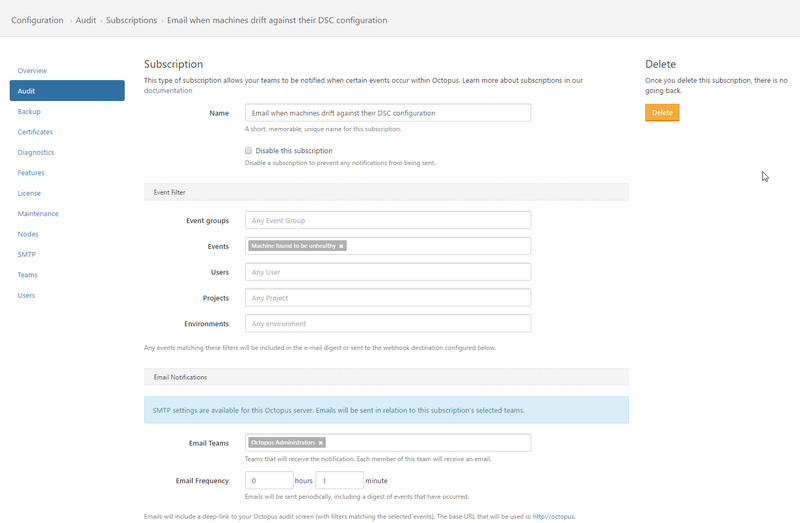 Over the last 6 months we've been working on a number of features that actually combine together to make Octopus a really effective configuration management tool when combined with PowerShell DSC. 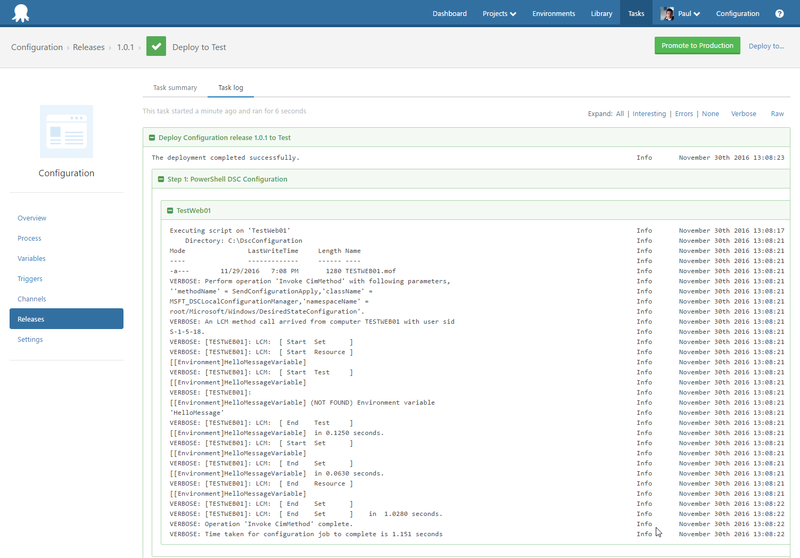 In this post, I want to demonstrate how Octopus can be used to manage, test and promote PowerShell DSC scripts, and how Octopus and PowerShell DSC can be used together. 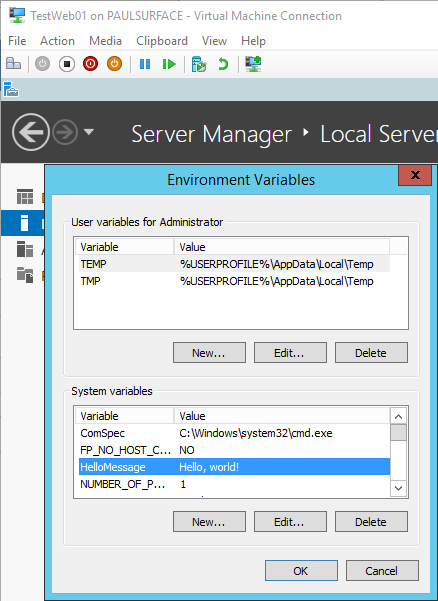 Microsoft supports two ways to deploy PowerShell DSC scripts between servers - "push" and "pull" servers. This is a central server that stores the configurations for each of your nodes. For most of our customers, they've already set up our Octopus and Tentacle agents between the machines, and guess what: Octopus and Tentacle can be configured in listening (push) and polling (pull) modes! And it has some benefits: Octopus/Tentacle communication is secure, doesn't expect machines to be on the same domain, supports proxy servers, and many other features. 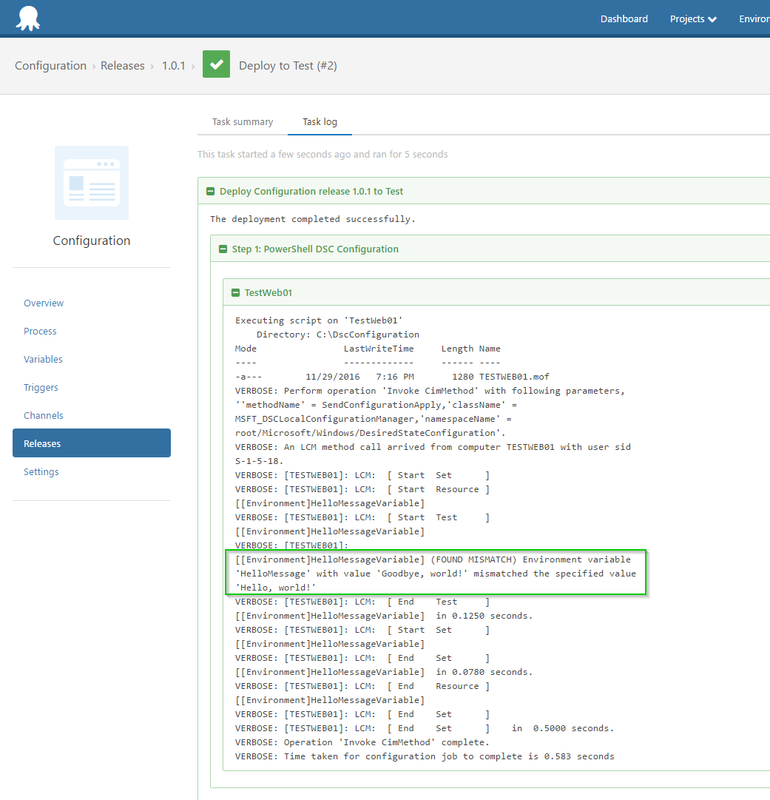 So if you're using Octopus and Tentacle, you should just be able to deploy your PowerShell DSC scripts using Octopus, without requiring a DSC pull/push server. One less thing to manage! I set up SQL Server and Octopus on the Octopus server, and I set up Tentacle (in polling mode) on the two web servers. I didn't add any other Windows features or do anything else to configure them. Start-DscConfiguration -Wait -Verbose -Path "C:\DscConfiguration"
It defines the configuration. Note that we use localhost since this script will run directly on each web server. Now, that's pretty interesting, but DSC isn't doing much right now that couldn't be done with standard PowerShell (although it is more declarative, which is nice). We still had to re-deploy the DSC script to force it to be overridden. The powerful thing about DSC's declarative model is the ability to detect drift - when the reality of what's configured on the machine doesn't match what it was supposed to be configured. Write-Host "Machine has not drifted"
Write-Host "No configuration has been applied to the machine yet"
When the machine drifts from its desired configuration, it will become "unhealthy" in Octopus. 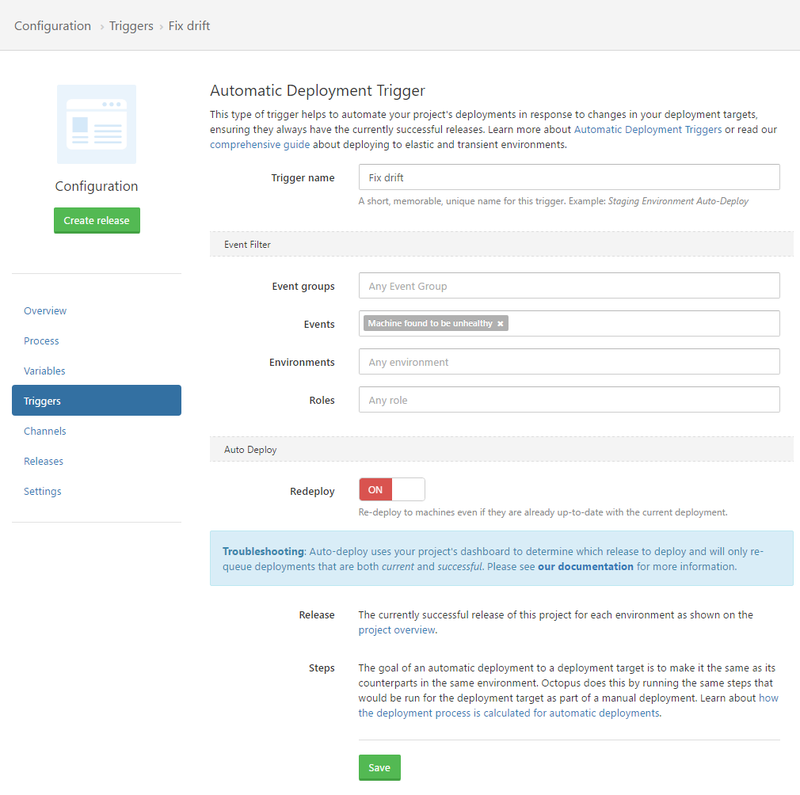 This is convenient as we can set up an automatic deployment Trigger in Octopus to automatically deploy the current DSC script on top of the machine. This will re-apply the configuration, and correct the drift. While Octopus focuses on what's traditionally called "Application Release Automation", we have a growing number of customers using it for Configuration Management too. 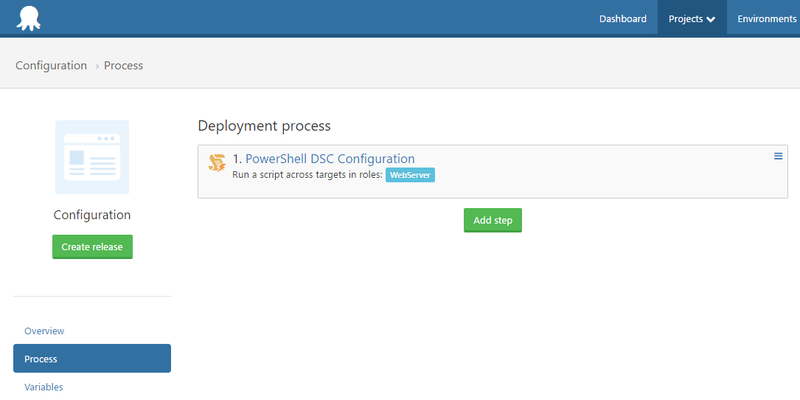 PowerShell DSC and Octopus make it easy to dip your toes into the configuration management space, and the flexibility means you can build projects that contain a mix of PowerShell DSC, traditional scripts, Chocolatey commands, and application deployment. 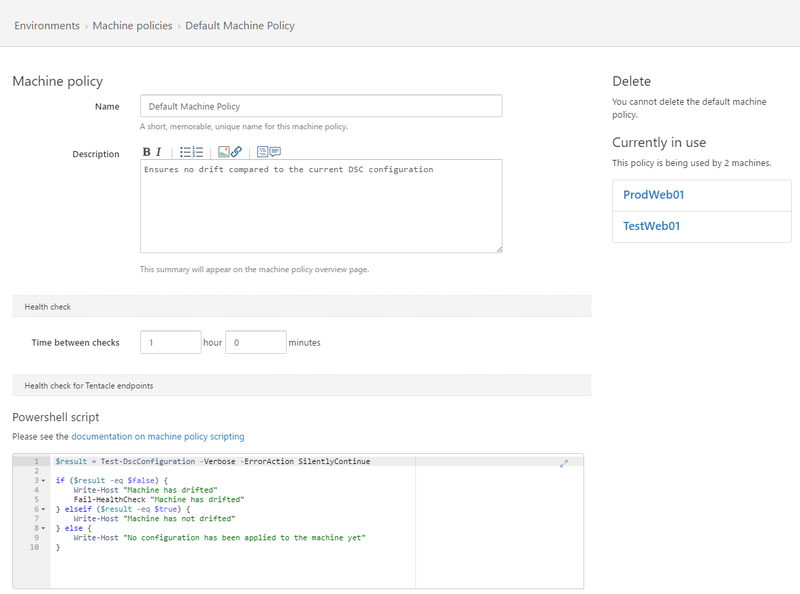 The new features we've added in the last 6 months - automatic deployment triggers and custom health check policies - really help to close the loop when using Octopus to deploy, manage and test PowerShell DSC scripts. In 2017 we have more plans around PowerShell DSC, and we're aiming to put one of our RFC blog posts out early next year with our ideas. If you want to learn more about PowerShell DSC, I really like this article: PowerShell DSC: The Basics. Are you using PowerShell DSC with/without Octopus?